Editor's note: A previous version of this column first appeared as a chapter in the Vox eBook, The Long Economic and Political Shadow of History, Volume 3, available to download here. 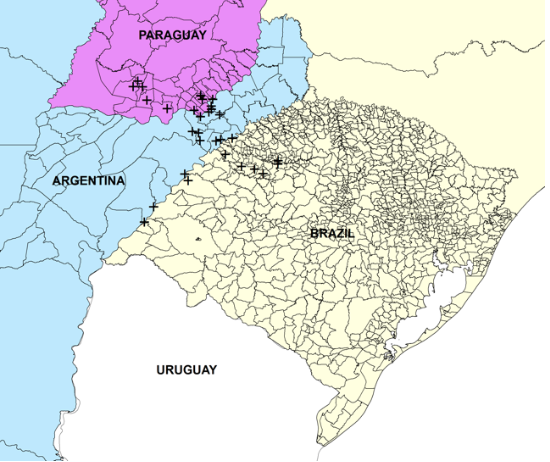 Notes: The figure is an unconditional plot of 2000 literacy in percentages for people aged 15 and older in Argentina, Brazil and Paraguay versus distance of the municipality centroid in kilometers to the nearest Jesuit mission. Orange triangles represent missionary municipalities and blue dots non-missionary ones. The red line is a linear trend. The sample is restricted to a 225 kilometers distance threshold. 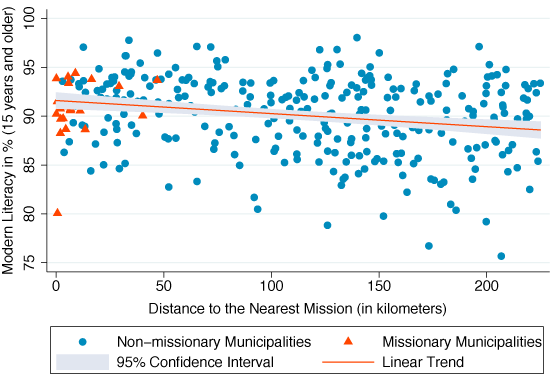 Note that distances for missionary districts are not necessarily zero, as they are measured from the municipality's centroid. Bustos, P, B Caprettini and J Ponticelli. (2016). "Agricultural Productivity and Structural Transformation: Evidence from Brazil", American Economic Review 106(6): 1320-65. Cagé, J and V Rueda (2016),"The Long-Term Effects of the Printing Press in Sub-Saharan Africa”, American Economic Journal: Applied Economics 8(3): 69-99. Dell, M. (2010), “The Persistent Effects of Peru's Mining Mita”, Econometrica 78(6): 1863–1903. Valencia Caicedo, F and H-J Voth (forthcoming), “Christ's Shadow: Non-cognitive Skills and Prosocial Behavior Amongst the Guarani”, Bonn University. 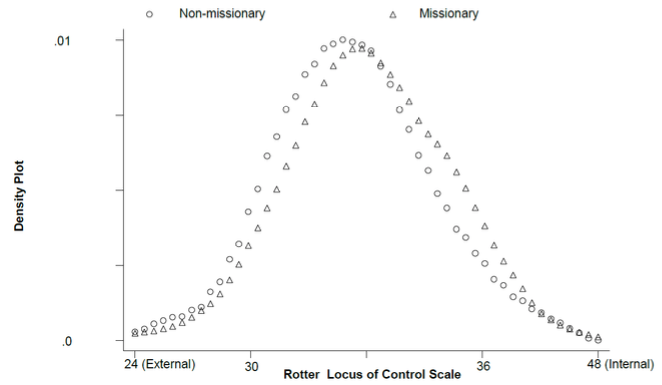 Waldinger, M (2017), "The long-run effects of missionary orders in Mexico”, Journal of Development Economics 127: 355-378.